You must be planning a backpacking trip. And you're being smart about backpacking nutrition, because you want to enjoy yourself without returning home an empty wreck of your former self. Backpacking means you're restricted on how much weight you can carry for your food. You'll also need to have regular surface water sources, because you don't want the unwelcome burden of lugging around liters of water for food preparation. This all adds up to the sometimes unpleasant task of having to pre-calculate your food calories, nutrient density, and weight, right down to the last ounce. 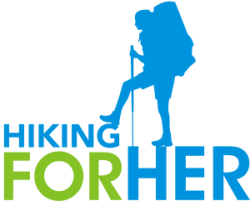 Here's an easy way to do that: use the Hiking For Her Fast Facts booklet. It steps you through exactly how to figure all of this out, and leaves you with a solid backpacking food plan. Get yours for under $2. The best backpacking nutrition tips should also be easy. Here is one of the best ideas to stay strong and well on the trail, day after day: plan your food choices for optimum nutrient density. 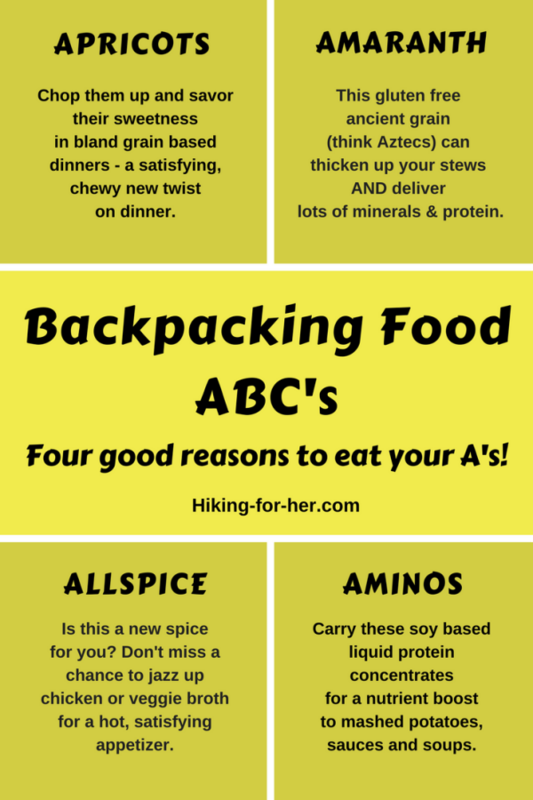 As you plan your backpacking menu, use the ABC method to make sure all of your nutrients and taste preferences are covered. Let's start with eating for A's on the trail. Bookmark this page forthe full list! Always something unusual and unique here for you, and that's a promise. If you have a bit more money than time, skip a lot of the backpacking food preparation work and carry lightweight, pre-packaged entrées for dinner. NOTE: If you've got a gluten intolerance or outright allergy, you need to step up your game a bit. Use these GF hiking food tips. Rice has been a staple in backpacking food menus for decades, as well as a global food source for millennia. It delivers various amounts of carbohydrates, for conversion into energy. But not all rice works for you on the trail. 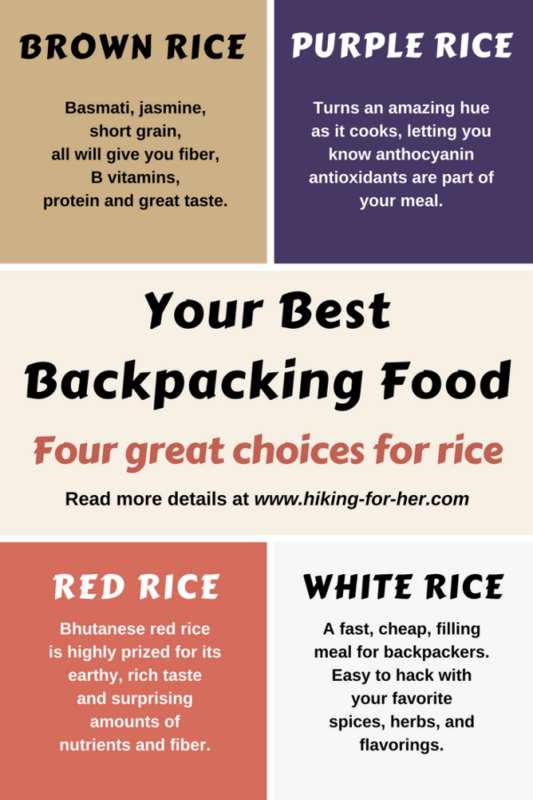 Read this for how to choose the best rice for your hiking trip. To stay strong and feel full on the trail, you're going to have to plan to include some protein in every meal, even your snacking schedule. Read how to do that here. And don't forget to pack high quality nuts, for both protein and fats. 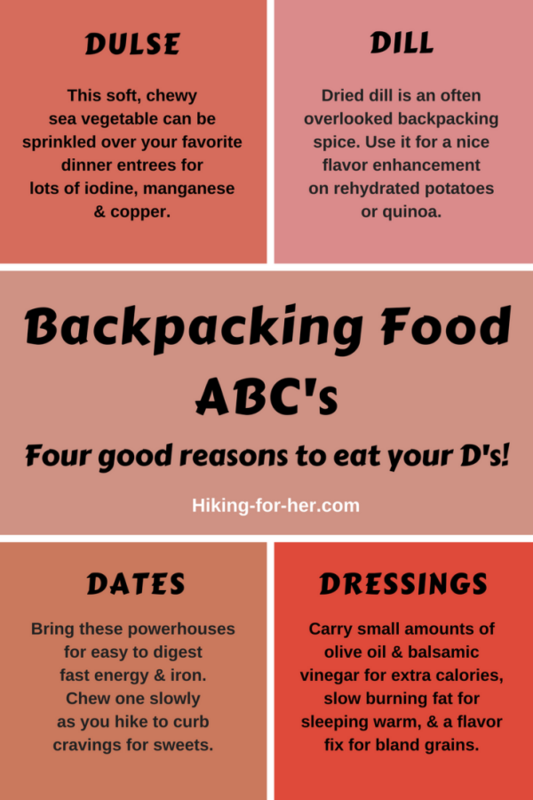 Here's a quick list of perfect food choices to bring on your backpacking trip, loaded with the calories you need but not heavy, bulky, or hard to eat. This page is just getting started with offering you the best nutrition tips for your backpacking plans. Hiking For Her is always learning, experimenting, and dreaming up new ways to sneak both flavor and nutrients into a hiking menu. If you need a few ideas for getting started with some solid backpacking food ideas, try this.